Click below to get the most comprehensive presentation of the New Paradigm! Take a look at the international coverage of Helga Zepp-LaRouche and the Schiller Institute. Here you can find all of the latest developments related to the Belt and Road initiative. For over 30 years, the Schiller Institute has been leading the fight to replace the geopolitical order in the world, with a New Paradigm based on the mutual respect and development of perfectly sovereign nation states. It is named after Friedrich Schiller, the great 18th-century German poet and playwright, whose works have inspired republican opposition to oligarchic tyranny worldwide. 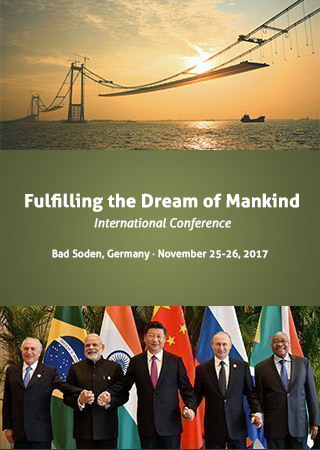 The Schiller Institute has organized hundreds of international conferences to join the intellectual and moral forces worldwide, from the highest academic, cultural and political echelon to the youth on the streets and campuses. Our conferences and policies have obtained great recognition by officials and governments such as Mexico, Malaysia, Yemen, India and especially with the development of the so-called New Silk Road in China. What is The New Paradigm and what it means for the world! What is the media trying to hide from us? Why is there so much slandering of the New Paradigm? What is the New Paradigm? In a world where systemic economic crises and proxy warfare have become the new normal, it’s not hyperbole to say that we are—as a planet—at the end of the post WWII paradigm. EIR’s comprehensive study of the progress of the Eurasian Land-Bridge project which Lyndon and Helga LaRouche have championed for over 20 years, has finally been completed. This Website is a Platform For Creating a New Paradigm. Human civilization is currently threatened by the most dire crisis in modern history: an ongoing disintegration of the world economic system, leading into a a threatened thermonuclear confrontation, and deepened by cultural degeneration. A shift to a new paradigm is the only way forward. This paradigm shift must address the axioms underlying today’s catastrophic policies, and must be as fundamental as that axiomatic shift which moved European civilization out of the Middle Ages into modern times, with all its breakthroughs in natural science and Classical artistic composition. The Middle Ages, which was characterized by scholasticism and superstition, was replaced by a focus on modern science and modern culture. This website is intended to serve as a platform for exchanging and developing this paradigm shift. Send us your papers and ideas from whichever field you work in; from scientific research, engineering, and agriculture, to great Classical artistic composition and performance. To avoid world war, to overcome the poverty and hunger connected with underdevelopment, to develop humanity’s capacity in the solar system and the galaxy, and to inspire the youth generation with works of beauty to fight for a future: your talents are needed!